How has British industry financed itself in the past? With the current debate on industry's financial strategy, this study of the past sixty years is a particularly timely contribution to the discussions on the future financing of industry. This book gives, for the inter-war years, a detailed examination of the main sources of funds, covering long-term and short-term funding. It also traces the transition in the new issue market and explores the course of firms' own internal funds, and ends his coverage of the pre-war years with a chapter on the Macmillan Gap. 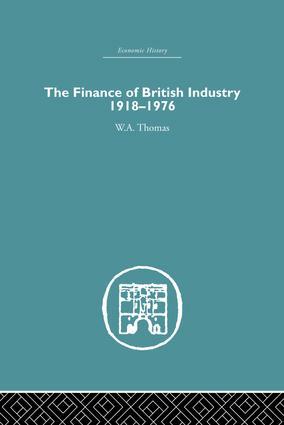 Dr Thomas puts particular emphasis on the influence of government policy on the financing of industry in post-war Britain. He also explains the effects the new sources of finance have had on industry and the major public corporations. His last chapter surveys the later developments in the main sources and uses of funds and the factors responsible for them, and includes an illuminating comparison of financial practices in some of the major overseas industrial countries. Dr. Thomas has written a clear and objective account describing the trends in finance since the First World War. His notably well-documented book is an essential reference work. 9. Trade credit, short-medium-term finance.